Glyphosate is an acid molecule and the active ingredient in the world’s most utilized herbicide that was intentionally created to kill weeds that compete with commercial crops such as corn and soy. 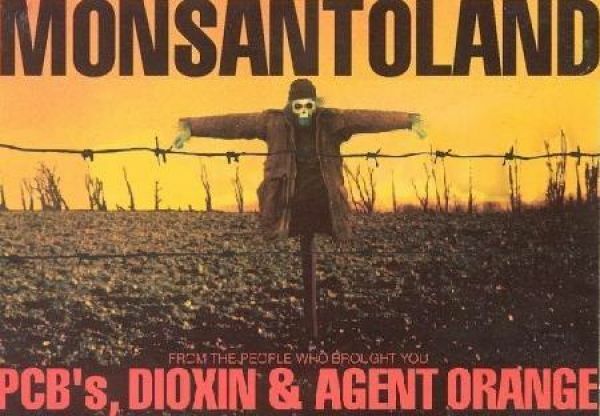 Back in 1970, one of Monsanto’s chemists, John E. Franz, manufactured this highly controversial, probable carcinogenic and marketed it under the trade name Roundup. Glyphosate-resistant crops have the chemical compound inside them, and the intention was for farmers to be able to spray the crops with more weed-killer without killing the edible plants, but this trait is failing miserably across the globe, causing health detriment, soil nutrient depletion and environmental disturbances that go unreported by the mainstream media. Nearly 200 million pounds are dumped on American soil each year, including the agricultural sector, home gardens and yards. Over the past couple decades, weed resistance has become a major problem as “Superweeds” have become immune to Roundup and are destroying the yield once thought to be improving by this biotechnology, though Monsanto advocates would have the public, farmers and health organizations believe otherwise to protect their investments, sales and profits. Hundreds of tests and independent, reliable studies have been conducted that expose Glyphosate as a major threat to human health, but since the FDA and EPA rely solely on safety tests done by the manufacturer, no regulations are put in place to protect humans, animals or the environment from this known cancer-causing weed killer. The chemical is absorbed throughout foliage and even seeps into roots. Glyphosate is also used as a drying agent that is sprayed on crops heavily, such as wheat and sugarcane, just before harvesting for storage in silos. The term “Roundup Ready” means the crop’s seeds are genetically engineered to contain the toxic and deadly herbicide. Scientific correlations have also been made between Glyphosate and non-Hodgkin lymphoma (NHL). The increased risk of farmers contacting NHL has been identified in farm workers using Roundup as recently as 2014. In March of 2015, the International Agency for Research on Cancer (IARC), a subsidiary branch of the World Health Organization (WHO), published a summary of studies on the dangers of Glyphosate. The World Health Organization has revealed in-depth research exposing Glyphosate as “probably carcinogenic in humans” based on epidemiological studies, animal studies and in vitro studies. Laboratory studies dating as far back as 1991 and 1992 reveal that Glyphosate can harm beneficial insects and earthworms. It can also harm the bacterial ecology of soil and cause micronutrient deficiencies in plants, which explains much of the immuno-deficiencies in Americans who consume GM corn and soy regularly. Prior to 1970, Glyphosate was synthesized in a laboratory by a Swiss chemist that patented the chemical chelator “agent” that was known then to bind and remove the minerals calcium, magnesium, copper, zinc and manganese. Glyphosate also kills plants and bacteria by interfering with the synthesis of the amino acids tyrosine, tryptophan and phenylalanine by inhibiting certain enzymes. Glyphosate residues are NOT always immobile and do have the potential to contaminate surface waters through soil erosion as it adsorbs (remains as thin film on surface) to soil particles suspended in runoff. Glyphosate is NOT tested by the FDA’s Pesticide Residue Monitoring Program nor the USDA’s Pesticide Data Program, and field tests show that carrots, lettuce and barley contain residues up to ONE YEAR after the soil is treated with just three pounds of Glyphosate per acre. Contamination of surface water is attributed to urban and agricultural use. People spray Roundup on sidewalks, to clear railroad tracks, and to try to eradicate weeds from their yards. It’s also used in aerial spraying. Laboratory toxicology studies reveal that other ingredients in combination with Glyphosate may have greater toxicity than Glyphosate and might also propel the toxicity and carcinogenic (cancer-causing) actions of Glyphosate itself. Since Monsanto’s patent on Glyphosate expired in the year 2000, most of the agrochemical (chemical industrial) companies and corporations manufacture and produce Glyphosate now, including Bayer CropScience, BASF, Dow AgroSciences, DuPont, Syngenta and a host of Chinese manufacturers. Glyphosate is now combined with over 400 chemical and commercial adjuvants (agents that enhances the effect of Glyphosate) from more than thirty companies worldwide for agricultural use. Roundup products, including genetically modified seeds, represent half of Monsanto’s gross profits.